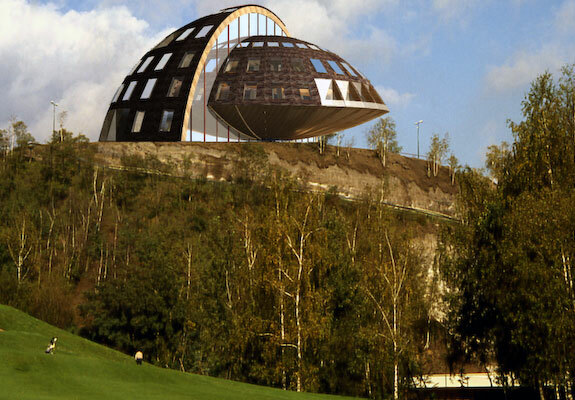 There are surprisingly quite a few oddly constructed green homes sprinkled around the globe. This one has a shared feature with the home in Part 1 of our Unusually Green series, and ranked next on the list because of its unique dominant ability – it moves. Over the course of about 5 minutes this house can do a 150° rotation by way of an elastomeric belt. It is constructed with arches that anchor to a gear ring forged from steel and affixed to a solid concrete base. Unbelievably, it only uses around the quarter of the energy required to run an average household vacuum cleaner to make the turn. The wooden structure called Domespace is the creation of the sustainably focused firm Solaleya and was designed by Patrick Marsilli. The ability to move facilitates an energy efficient design since the rotating structure can be turned toward or away from the sun depending on the weather, which assists in controlling the internal temperature. A fireplace is centrally located which adds to the geothermal advantage as the natural climate from the earth can rise up and throughout the large space. The Domespace model can also be upgraded with optional solar panels to make the most of passive solar energy. It is built off of the ground for humidity control and the roof is made of sustainably sourced, mildew and fire resistant cedar constructed without the use of dangerous chemicals. The company also incorporates the use of other renewable and recycled materials in their home designs. Additionally, it is built to ward off high winds with its aerodynamic shape and is earthquake resistant. The company offers another version of the movable dome design, the impressive Emergence. Solaleya reported that over the course of the last 20 years they have built around 200 Domespaces throughout France, along with spots in Taiwan, Spain, Germany and Switzerland. Check out their presentation for more information on building a Domespace home. All images are via Solaleya.